Google Keyword Problem – Statcounter Blog. 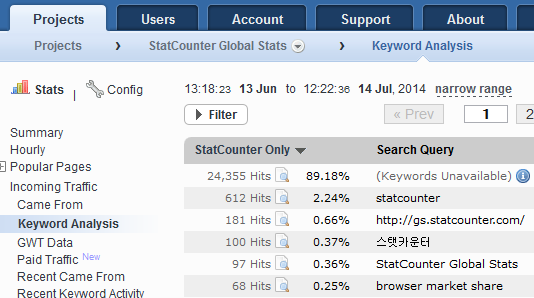 Have you noticed “Keywords Unavailable” in your StatCounter reports? Unfortunately, this is due to a decision by Google to withhold this keyword information. Since 2011 Google has been steadily expanding its policy of withholding keyword data for organic search. This means that website owners and professionals have limited access to the keywords used to find their sites. While we at StatCounter can’t undo what Google has done, we have added a new feature to our service to maximize and streamline access to available keyword data. We have integrated Google Webmaster Tools (GWT) keyword data into our reporting. This means that you, our members, can have efficient, streamlined access to all available keyword data. You can read more about it in our press release here. 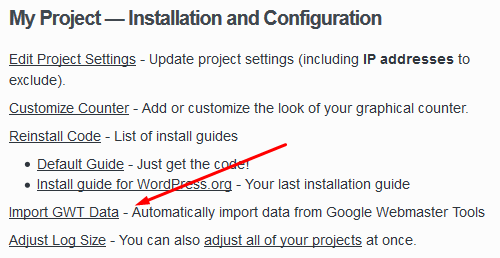 Click the “Wrench Icon” beside your project name. 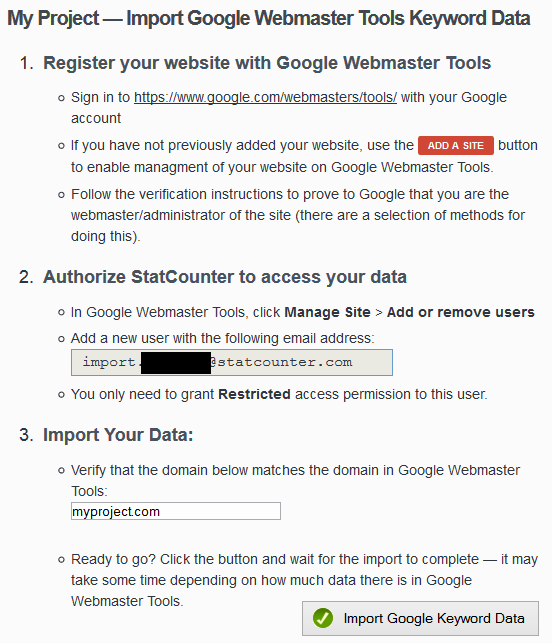 Finally, follow the steps outlined on the page to link StatCounter with your GWT account. This is the usual Keyword Analysis stat. This shows the GWT keyword data only. Note that the stats are presented in the familar StatCounter style. 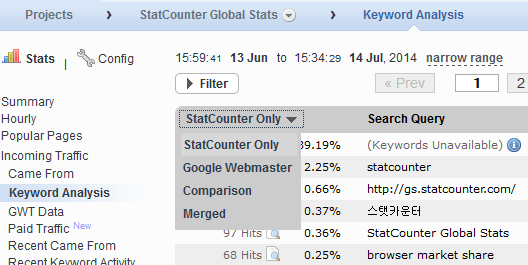 This shows the GWT keyword data alongside the StatCounter data. You can look at each keyword and compare direct StatCounter data with indirect data collected from GWT. The ‘Merged’ option includes the standard StatCounter data but redistributes the Google portion of the ‘Keywords Unavailable’ data according to the spread of keywords in the Google Webmaster Tools dataset. Email reports will automatically include this merged data. Finally there is an entirely new stat called GWT Data which is based solely on the GWT keyword data. It shows you the clicks, impressions and positions of your keywords. You can click the drill down link beside each result to see how individual keywords have performed over time. See a sample graph below. We hope this new addition to your stats is useful. Please share your thoughts, comments, questions and suggestions below. Thanks Stat Counter for adding such a great feature. thank you for this future. I used this feature on my site. Thank you for the great feature.